Acrylic display box box with hinged top lid - 18"D x 18" W x 24" H - 3/16" Thick.Custom made acrylic display case. Acrylic display boxes with top door are a convenient was of displaying and storing products or other items. This acrylic box with hinged top lid is a robust retail display unit being constructed of 3/16" thick material. Its large flat base keeps this square box with lid standing stable on counters whether full or half full or completely empty. 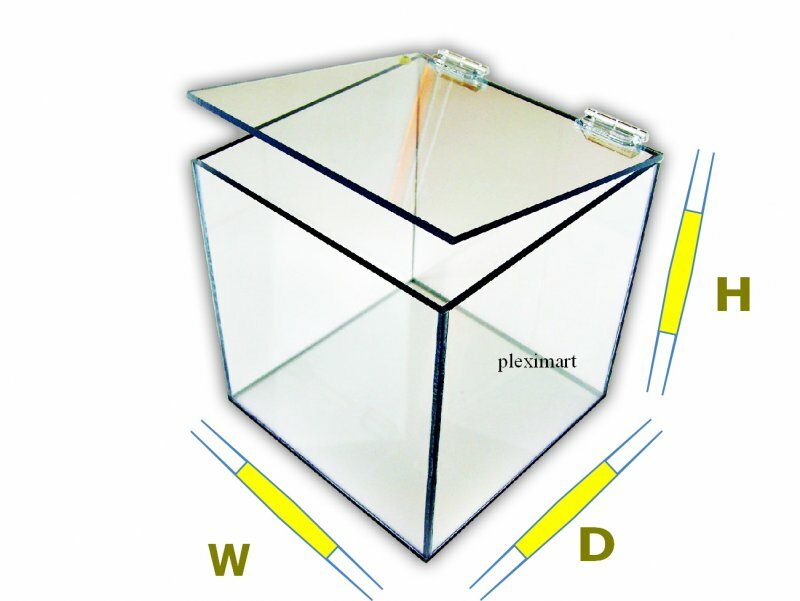 The acrylic box with top door is also safe to handle and maneuver, with its sides and edges polished . This box also has a hinged top door, allowing one to cover and protect products and items inside from dust, etc. The open top makes it easy for costumers and staff to access and/or change the contents within the box. Hinged box is designed to be light weight, so it is easy to move around and reposition as many times as needed. The hinged box arrives fully assembled and ready to go.